I have a little March poem FREEBIE for you today. As I’ve mentioned before, we do a poem each month to help with the Oral Language/Speaking standards and grades. I have never liked our March poems. We have never kept one more than 1 year. I need to send a poem home with my Friday Note tomorrow, so I came up with this dorky thing. Shockingly, it’s better than what we’ve used in the past. Shakespeare it is not. But it will have to do. 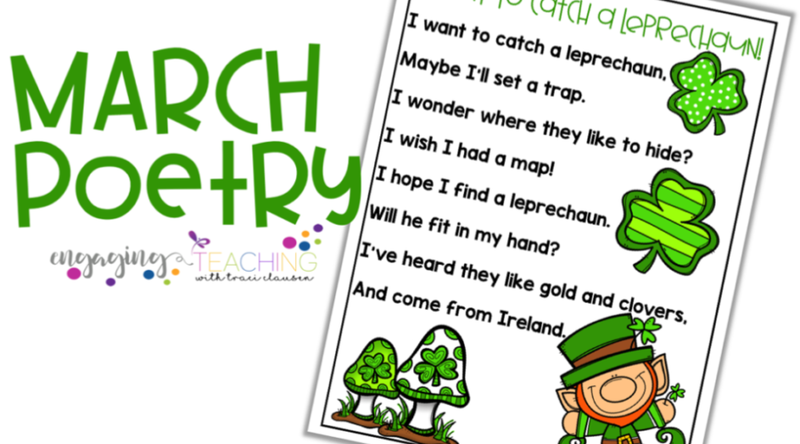 Click here to download the March Poetry FREEBIE! Click here for more March activities and FREEBIES! Yes, I can do that for you this weekend!!! 🙂 Too cute! That is darling. You could go into business! Thanks for sharing. What a cute poem! I love it. Thanks for sharing, I will definitely use it! Your March poem is very cute! Here's the one I use. No idea where I got it. And knocks at every door. I think it's precious! Good for you and Thanks!! This poem is so stink in cute! Thanks for sharing the poem. It's perfect for my weekly poetry/fluency homework. I needed a St. Patrick's day poem. anyway that you would be willing to email it? Love the poem and the word cards, also!